Sensational experience lies ahead! In reflecting upon my upcoming Retreat to Japan, I was envisioning how best to guide this experience. 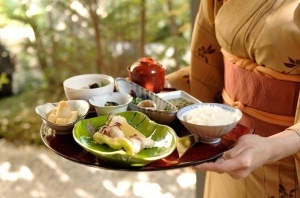 Japan is an exotic land, with the most courteous people, that will appeal to your all of your senses. Wherever you travel, you can become uniquely stimulated by the sights and sounds all around. I will always remember the diverse, colorful clothes in Thailand. Exquisite aromas of the marketplace in Costa Rica. Verbose, loud people talking with hand gestures in Italy. Incense scent of the temples of India. Pleasant floral smells from gardens in France. Playful children in Vietnam. Roosters crowing at sunrise in Bali. What is this key to move out of overwhelm and toward sensational contentment? A shift in perspective is all that is needed. Rather than being bombarded by distractions, noise and extraneous information, start to notice what your senses take in. Then, allow the sensory input to guide you toward a focus. Be still, be present and choose ONE sense (taste, touch, sight, sound, smell). Just pick one. Then, mindfully direct your attention to a specific, present moment experience of that one sense. Tune out all extra stimuli and clearly direct your attention to one specific thing. For example, sitting in a noisy restaurant, select to hear one pleasant noise. Listen to the background music or the rain patter outside. Savor the pleasant sound amidst the overriding noise. Let’s take a stroll with one of the five senses and learn how to practice awareness through everyday sensory experiences. The key practice, to begin with, is to take a DEDICATED 2 MINUTES of MINDFULNESS. Set a timer! It is best not to be random about it as your mind will wander off in distraction. It has to start as a dedicated practice. Let’s choose TASTE. For 2 minutes, mindfully choose ONE flavor of your meal to eat (the carrot in the salad) or when sipping a warm beverage. TASTE the experience of the temperature in the mouth, what part of the tongue do you notice, the texture, the after taste, etc. Pause and witness the unfolding of your experience for 2 minutes. Do this at least 3 times per day, at each meal, and even with an in-between snack. This simple daily practice, 6 minutes of Taste Mindfulness Meditation, will bring you to deeper meaning and fulfillment with food. Trust me on this. Silence is golden and focus is foundational. Turn off the myriad of outside input to tune in to one sensory experience. Let’s do this together and appreciate Japan in a savoring, contented and transformative way. Join me for Mindful Savoring of Yoga and Culture in Japan. 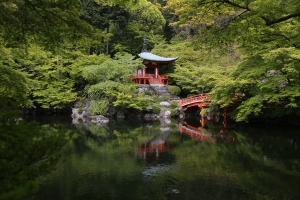 You will experience an intimate encounter with Japan and take it all in through the senses. Learn Mindfulness Meditation in a unique way. Learn to spiritually sip your tea, peacefully linger with bells or waterfalls, or joyfully experience colors. This will not be your ordinary sightseeing tour. It will be an impactful, fulfilling and unforgettable journey. You will awaken your senses and learn to appreciate the simplicity and beauty of the exotic Land of the Rising Sun. Contact Michele to receive Yoga Notes from Michele, a quarterly educational newsletter. I would also love to hear about the outcome with your Dedicated 2 Minutes of Savoring Mindfulness Practice. For me, it is life-transforming and worth every minute of it.